Hug, named simply because that's how it feels when you wear it – is a cushy, go-to vest for all seasons. 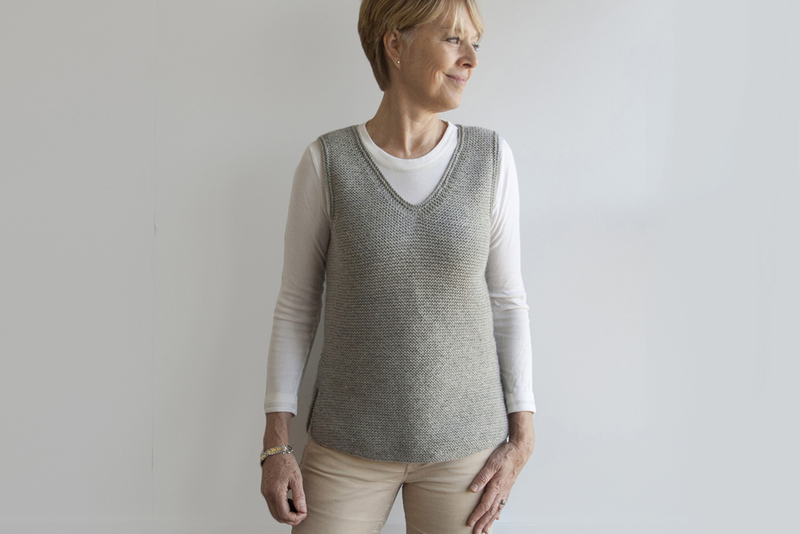 Adding style to comfort my Hug vest is hip-length, with a deep v-neckline, shaping at its waist, slits at its sides, and buttons down its back. Worked in garter stitch throughout, short rows at front and back hems create a dip at their centers. This piece is worked without seams from the bottom up. Garter trimming at the neckline and armholes finishes off these edges. You'll find this classic piece to be a quick knit and a fun project. color – Silver Grey #8401; 4, 4, 5, 5, 6, 6, 6 skeins, or for comparable yarn, approx 810, 880, 970, 1060, 1150, 1230, 1320 yards / 745, 805, 890, 970, 1055, 1125, 1210 m.
12 page pdf includes pattern instructions, row tracking grid for at the same time instructions, photographs, schematics, and standard abbreviations and definitions relevant to this pattern.